← Dying for a burger? Why are trans fats still legal?! 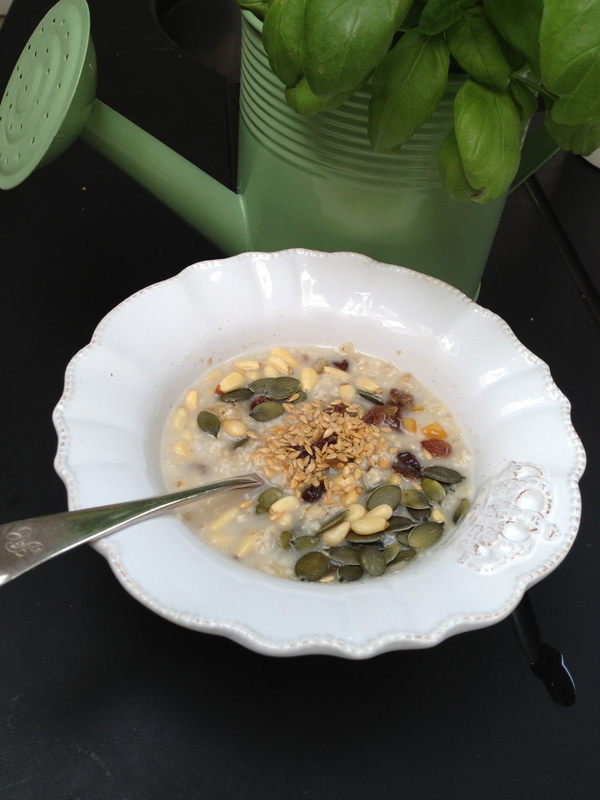 Porridge days – Why not?! Porridge is a warm, satisfying and healthy breakfast. I always recommend it to children because oats has so many health benefits. I enjoy it with nuts, dry fruit, a pinch a cinnamon, some seeds and a drop of maple syrup. Seeds are great to give you healthy springtime energy! If you are in a bit of a hurry, there is no need to cook it: you can just soak the rolled oats into the same volume of boiling water and let it steep for a few minutes while you prepare your bag. Then just flavour it with anything you fancy and “Bob’s your uncle”! Other mornings, when you might be a little bit better organised, just cook one cup of porridge in two cups of boiling water for a 5/8 minutes, until it starts swelling and getting creamy. Then put a tiny pinch of salt, a dash of single cream (or soya cream like me) and spoon it out into two bowls. It is better to cook it with water then add the cream when you serve it, I find. If your children still prefer it cooked in milk that’s fine but the Scots always do it in water and it is much surprisingly creamier and better digested that way – try it for yourself! Add raisins, pine nuts, seeds or just cinnamon and maple syrup. I don’t even bother with the syrup and instead add half a grated apple and some dry raisins for sweetness. It is the best way to start a day and your tummy will feel grateful and comfy for a long time after it- so no hunger pangs at 11am while you are trying to get this important contract buckled down!.. This entry was posted in family favourite and tagged cinnamon, health, porridge oats, seeds, soya cream. Bookmark the permalink.